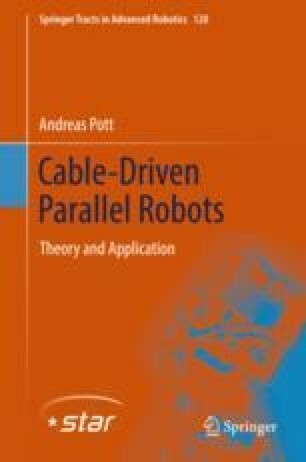 In this chapter, the design procedure of cable robots is addressed through a methodology presented in Sect. 8.2. Firstly, the application requirements that need to be satisfied by a cable robot are considered in Sect. 8.3. Secondly, different reference models for cable robots are reviewed in Sect. 8.4 that serve as parametric templates. These models are facilitated by different algorithms for geometry synthesis. Approaches based on optimization and interval analysis are presented in Sect. 8.5. The mechanical design of cable robots is discussed in Sect. 8.6.